Exhausted, relieved, grateful. Emptied the tank! Davis Cup in general is an experience you will never forget and I can safely say that this particular Davis Cup Tie Vs. Egypt was such an intense experience for me that I know it will be firmly etched in my memory for many years to come. We had lost a close Tie away to Hungary (3-2) back in early March which meant that this match Vs. Egypt was a Group 2 Relegation match. Winning meant we would stay in Group 2 and losing meant we would drop down to Group 3, a place where no country ever wants to end up. The pressure was on and there was a lot on the line but we all knew and felt we could win. 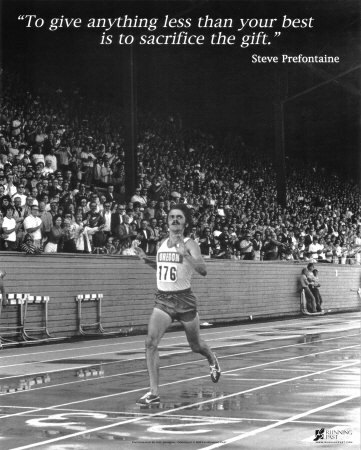 It had to come down to who was better prepared, who wanted it more and who was more willing to go the distance. 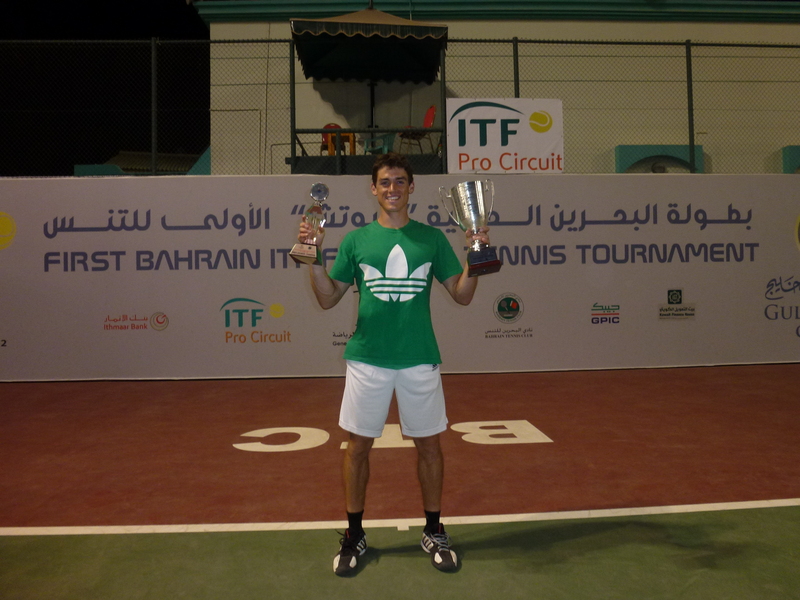 I had won a $10,000 Futures Singles and Doubles title ( w/Sam Barry) in Bahrain the week before the Tie so Sam and I flew from Bahrain to Cairo on the Sunday morning. The rest of the Irish Team flew from London. The team consisted of myself, Conor Niland, Sam Barry, James Cluskey and fifth man Daniel Glancy. Garry Cahill was team captain with Johnny McCormick as assistant coach and Nicky Greene as physical therapist. Straight off the bat I knew I was in for a rough ride. After squeezing our way through customs and eventually getting our Visa, Sam and I hustled our way through a crowded, muggy Cairo Airport to walk into what felt like an oven. 40 degrees Celsius outside, hoards and hoards of Egyptians crammed on the streets, car fumes stinging the nostrils, cars beeping and honking like it was the end of the world. All I wanted to do was get out of this airport, drop the bags and get into a nice air-conditioned room and sleep. I was feeling exhausted after playing 9 matches the week before and at that moment in time, I didn’t see how I would be able to summon the energy to practice during the week and then play 3 of the biggest matches of my life. My legs were shot, I was starving and Sam felt the same too. We hopped into a taxi which honestly looked like its engine was about to blow and the driver heaved my tennis bag onto the car roof, attempting to secure it with what might as well have been a piece of string. We took off down the road and our driver was ripping it, weaving in between cars like we were on the run being chased by police when all of a sudden I heard a noise on the car roof. I looked behind me to see my tennis bag literally sliding down the back of the car! “STOP!” I screamed to the driver, “Pull in!” My bag was hanging by a thread and if we had driven on 10 more metres I have no doubt it would have fallen off and been crushed by the relentless Cairo traffic. Believe me, drivers in Cairo are not going to stop because a tennis bag is on the road! I spoke with our captain Garry Cahill about how I was feeling and we both agreed that it was best I take it easy during the week leading up to the matches. One practice per day is good enough, a lot of water, a lot a sleep and a lot of food. That was the plan. I kept things simple during the whole week and didn’t venture anywhere else apart from the courts and hotel. We stayed in the Marriott Hotel which was a 5 minute walk from the El Gezera Stadium and we all made that walk every day to and from the courts. Security was tight in the hotel and each time we arrived there, we had to put our bags through a security scanner. There was tension in the air in Cairo and you could just tell something wasn’t right there. I had been on the road over 7 weeks by the time Davis Cup rolled round and despite the easy practice week, I was feeling just average going into my first match on the Friday vs. Karim Maamoun, a talented Egyptian player who plays with a bit of flare. I was obviously up for the match but my legs still felt heavy from the week before. I ended up beating Maamoun in 4 sets, 7-5 in the fourth which took over 4 hours in relentless 40 Degreee heat. He walked all over me in the first to take it 6-2 but I was quick to turn it around and get stuck-in in the 2nd set. I could tell by the end of the third set that his will was starting to break and I started to enjoy the feeling of who could suffer more, who had more will and who really believed in themselves. I took the fourth set 7-5. Victory! 1-0 Ireland. The first thing I did was go straight back to hotel, order room service (massive seafood platter), stretch, shower and then follow the live scores of Niland vs. Sabry. I was wrecked, really wrecked but still felt there was a bit of gas left in the tank. I’ve always liked the quote “To give anything less than your best is to sacrifice the gift” and I felt at that time that I must continue to give my absolute best, nothing less than everything I’ve got. At least that way I know in my heart I will have zero regrets at the end of it all. 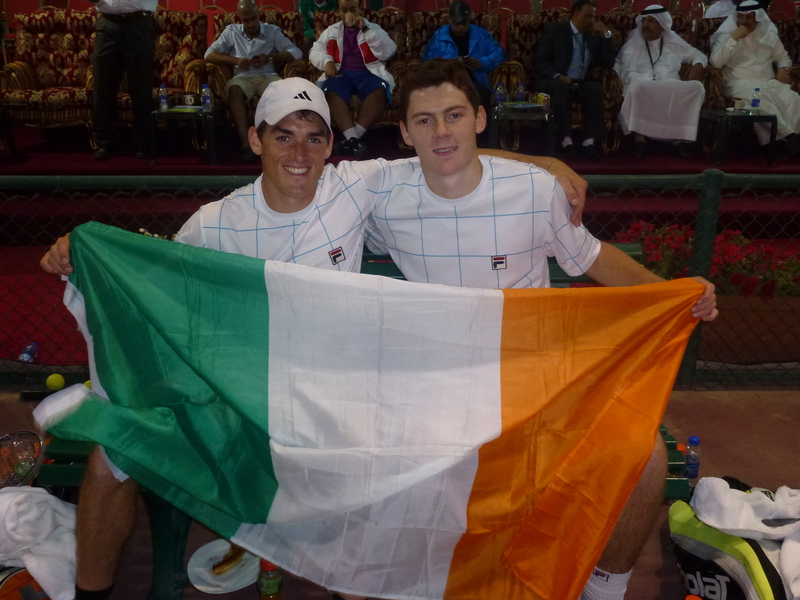 Tied at 1 all and coming into the doubles match on Saturday, myself and Sam both knew how big this match was. We knew it would be the match that turns the tide in our favour and would put more and more pressure on the Egyptians going into the last two singles on Sunday. We were rooming together this week and the night before, we went over every last detail to take these guys down. We came out far too fired up, almost like we were going into war and it didn’t serve us well. Our opponents were focused and playing with conviction while the two of us were a little caught up in the emotion of the occasion. We settled down and just about won the second set 7-6, I believe this set was one of the most important sets of the Tie as it gave us the belief to win the match as well as discouraging our opponents at the same time. Sam and I started to relax and really play freely for the next 2 sets, we were the better team and we knew it. Come on! 2-1 Ireland now, only one more point and this Tie is ours! We kept the same routine going the evening before the singles matches. I sat in the same seat I always sat at dinner and ordered the same meal, two main courses (salmon with rice and then a huge portion of chicken and beef fajitas). It always hit the spot! I was happy to listen to the rest of the lads have some banter, anything to take my thoughts off tomorrow was fine with me! Sam was scheduled to play Maamoun in the 4th rubber and I knew Sam had the beating of him. I stayed in the hotel room and waited anxiously as I received texts after every set. The match was like a see-saw, moving back and forth with huge momentum shifts each set. They were both on court over 4 hours by the time the fifth set started and I decided that I have to go and watch the end of the match and give Sam the energy he would need to win the match. He lost a nail biting fifth set 6-4 after Maamoun smacked a backhand winner crosscourt. It was a tough one to swallow but everyone on the team was extremely proud of Sam and the effort he put forth in his first live singles Davis Cup match. We couldn’t have asked for more. So there we were, tied at 2-2 on Sunday afternoon sitting down in the changing rooms getting ready for the fifth and final rubber. The Egyptians spectators and supporters were getting more and more vocal as it was clear they started to believe they could win. I had played Sherif Sabry about 6 weeks before this match at a Challenger in Morocco and lost 6-1 6-3 and I think everyone knew it! I could hear them from the stadium-they had chants going, drums beating and there was huge anticipation in the air towards this final match. 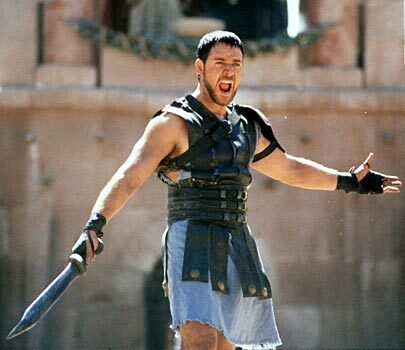 I felt like Russell Crowe in Gladiator going out to fight for my life, except this was real. Play was postponed with me leading 2 sets to 1 due to bad light on Sunday evening. The match had been a war up to that point and both Sabry and I were cramping in the third set, each point was sheer torture. My lungs felt like there were going to explode out of my chest and in between points I was gasping for air like I had just risen above water. I remember feeling how dry my mouth was in those rallies too, almost like I had the clay itself in my mouth with absolutely no saliva to swallow. Anytime I tried to swallow I felt like vomiting and the only thing that kept me going were those beautiful one minute changeovers that came every 3 games. I would spend the changeovers gulping water, chomping on pure sea salt to prevent cramps, sucking energy gels and Garry Cahill would put an ice towel on my neck while we spoke just a few words of tactics. We didn’t need to complicate things as we both knew this match wasn’t just about tactics, it was more about heart/guts and pushing yourself beyond your limits. Roles seemed to reverse going into what would surely be the final day of the Tie. Sabry came out swinging and took it to me from the first point, dominating the set to win it 6-3. I felt that if he could continue at this rate, he would beat me as I couldn’t find a way to beat him. That fifth set was a set I’ll never ever forget. There was so much on the line and all I can remember is the massive support I received from the whole team on the side of the court and the loud, boisterous Egyptians supporting their local hero Sabry. It seemed even the ball boys were against me as I watched them cheer on Sabry while asking them to pass me the ball! With the Egyptians clapping and whistling in between my first and second serves, it was clear they wanted to win by any means necessary, respectful or not. They were constantly shouting and chanting and purposely speaking in English so I would understand. I started to love it. I embraced everything. I went into the zone and suddenly came out of it at 5-2 in the fifth set up with Sabry serving and my first match point. I had played close to a near perfect set up until this point and suddenly things changed. I missed an easy smash on top of the net on my match point, then proceeded to get broken at 5-3 only to bring the match back on serve. It was turning into a nightmare! 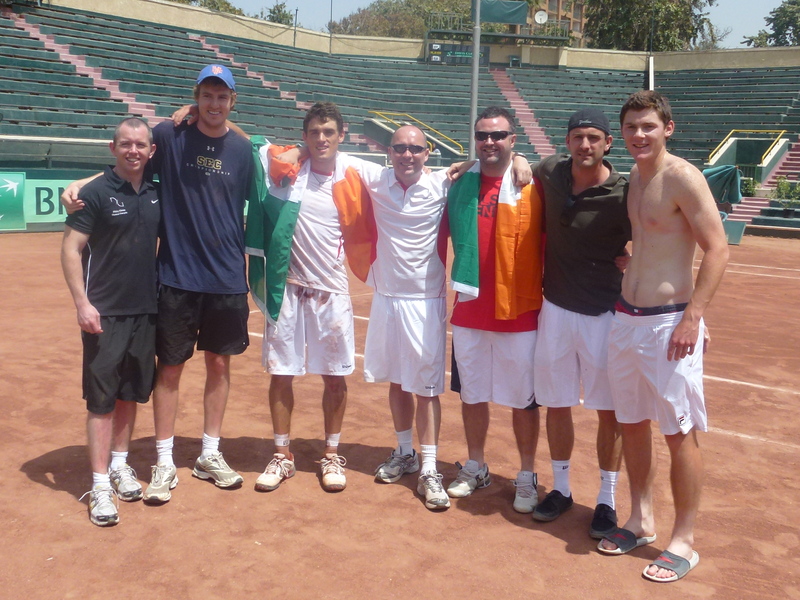 The tension was desperate and felt unbearable, the Irish Team were going crazy at the side of the court, the Egyptians were screaming, the ball boys looked rattled, everyone was completely immersed in the moment. I brought up a third match point and it only felt natural to bless myself, this match had taken every last ounce of my spirit and I knew something outside of myself would pull me through. We got into a long point before Sabry hit a dropshot on my backhand side, I sprinted up and slid into the backhand when suddenly things became really slow as if in slow motion, I hit the backhand down the line as I watched Sabry sprint to it, I felt he was going to pass me when I saw how much time he had to hit the forehand passing shot. I watched the ball ping from his strings away from me when I did what only felt natural to me, I leapt as explosively as I possibly could to reach the ball. It felt like I was hanging in the air for eternity. I stretched out my arm as the rest of my body was flying through the air and prayed the ball would hit the strings. ”Please God, just hit the strings!” IT DID! I hit a diving drop volley winner that Sabry couldn’t reach! I had won the match! I was in shock and all I remember are the lads literally exploding off their seats and jumping on top of me, screaming in my face, grabbing me and screaming all sorts of crazy things. I was covered in clay, sweat and blood. We got up and started singing ”Ole, Ole, Ole” dancing together in a massive circle with arms around each other. It was incredible. I had won the match to seal the Tie and helped Ireland stay in Group 2, it was a fantastic moment and completely euphoric for those few seconds. 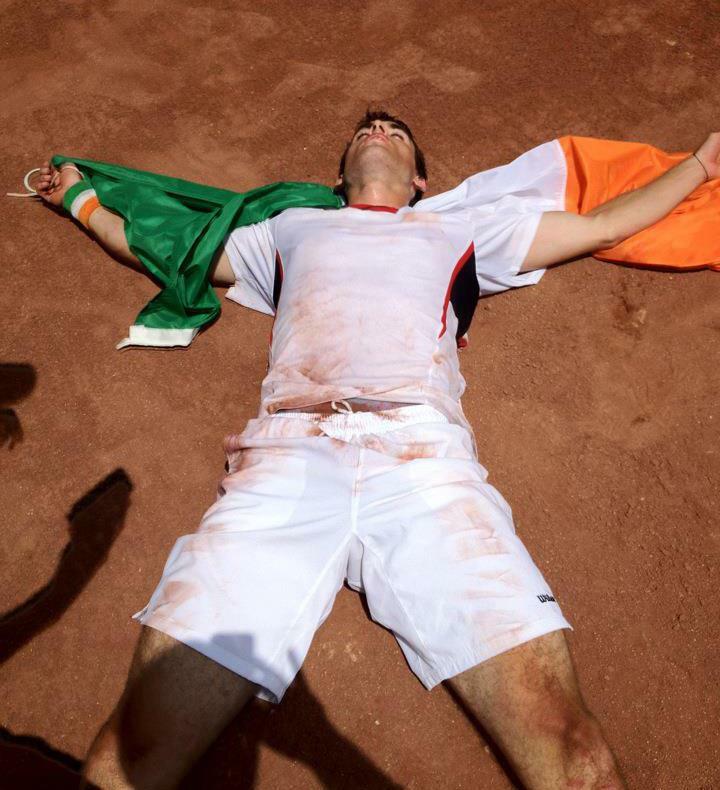 The picture below was taken of me minutes after I won the match and I even remember saying a few Hail Mary’s with the flag wrapped around me. Never in my life had I felt so exhausted, relieved and grateful at the same time. It was an AWESOME experience and one I will never forget. 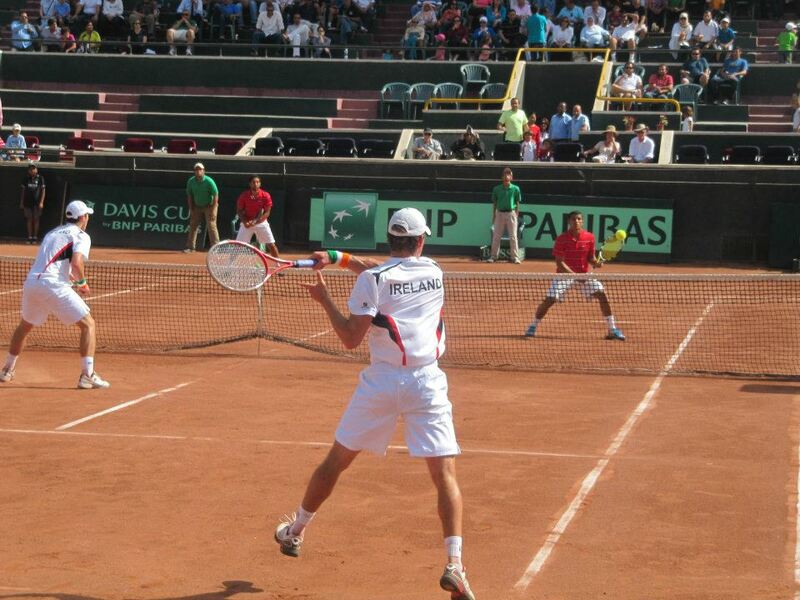 This entry was posted in Davis Cup, Irish Tennis, Match Report and tagged Davis Cup, Ireland Vs. Egypt. Bookmark the permalink. This is class, James. Such a good insight into the weekend. Feel like I was there after reading it! Way to focus on centering the ball, my young Padawan learner. Remember the force is all around us…let it flow THROUGH the racquet.